There are many New Orleans galleries that purvey traditional, sentimental images of Louisiana, but La Madama Bazarre lets loose a stellar consortium of underground artists whose multimedia work is alternately spiritual, delicately pretty, ethereally mystical and overtly sensual — drawing upon and reveling in all the glorious contradictions and cultures of New Orleans and its environs. Outsider art? Lowbrow? Underground? It doesn’t really matter. Beauty and strangeness abound in equal doses at La Madama Bazarre. Sculptress Lateefah Wright’s stoneware-clay two-headed dolls gaze at you with an almost sentient eeriness — then surprise you again when they turn out to be music boxes. Meanwhile, Jason London Hawkins’ Southern gothic reveries and Christopher Morrison-Slave’s expressionist and oddly tranquil acrylic swampscapes are contrastingly moody and somberly lulling. Patti Meagher and Althea Holden do their shape-shifting through the magic of glasswork. Photographer Sean Yseult sees Storyville in a new (red) light with her timelessly elegant E.J. Bellocq–inspired portraits, while doll maker Christy Kane and photographer Darla Teagarden evoke the mystique and allure of female mythology. It’s no surprise that an undercurrent of outsider rock & roll rebellion runs through much of the work at La Madama Bazarre — many of the gallery’s artists are well-known figures in the local and national underground music scenes. Sean Yseult first came to attention as bassist with hard-rock extremists White Zombie and currently plays with Star & Dagger. Artist Johnny Brashear has played with Rock City Morgue as well as Star & Dagger, while photographer Pauline Owens Teel sings in Chicken Snake. Christy Kane and gallery proprietress Jennifer Kirtlan used to conjure shadows together in the dream-rock trio Hazard County Girls. After originally opening La Madama Bazarre on St. Mary Street in the Lower Garden District in 2013, Kirtlan relocated the gallery to 910 Royal Street in the French Quarter of New Orleans. Ensconced in a classic 1837 brick building, La Madama Bazarre was situated across the street from the Cornstalk Hotel and next to Café Amelie and its historic Princess of Monaco courtyard. 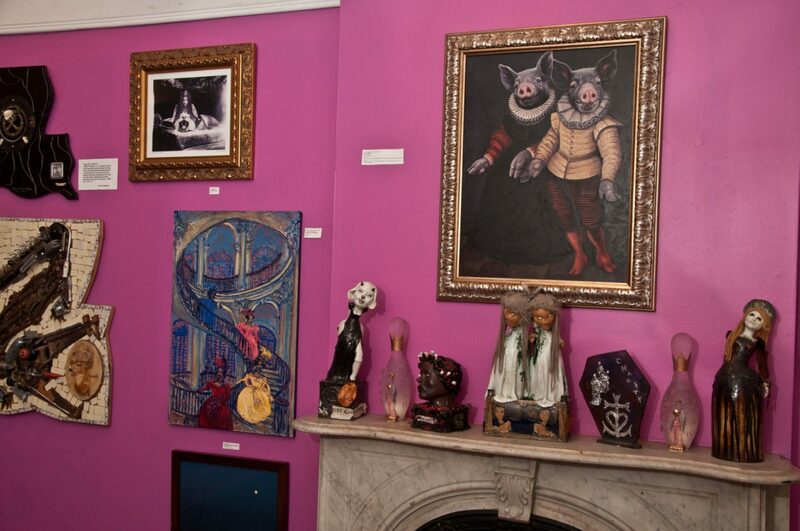 The gallery’s bubblegum-pink interior and white-frosting borders add a sweetly adorable contrast to the nightmarishly fantastic images, sculptures and other visual upendings that play across the walls of this most bizarre bazaar. More Pop Ups coming soon!